the tiny Republic of Goust, in the Pyrenes, which contains less than one hundred inhabitants, all of whom are Romanists. The sole occupation of these people is the weaving of wool and silk. Their government consists of an assembly of old men called the council. They pay no taxes nor imposts of any kind, and therefore have no need of collectors. They have neither mayor, priest, nor physician. They baptize their children, bury their dead, and perform their marriage ceremonies all beyond the boundaries of the town, or in the neighboring village of Laruns. If any one wishes to marry a wife he must go away from home to find her. Among the peaceful residents of this microscopic republic are several centenarians. No one is really poor, and none are rich. The language which they talk is a mixture of French and Spanish, and their numbers, and manners, have remained unchanged for several centuries. 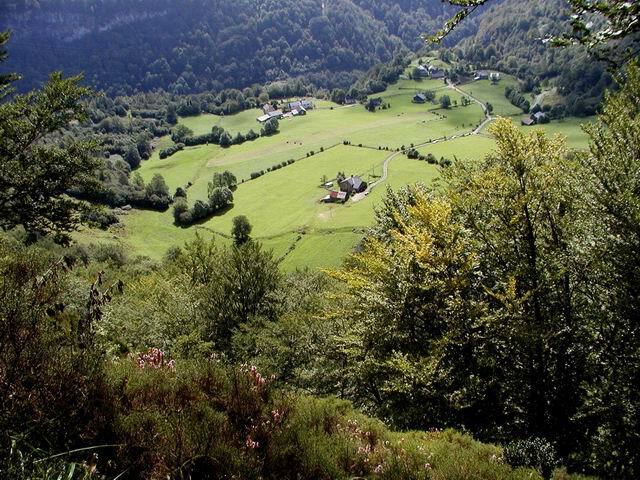 Goust, a hamlet in the commune of Laruns, at thirty minutes' distance from Eaux-Chaudes, in Basses Pyrenees, at an elevation of nine hundred and ninety-five meters, on a plateau dominating a gorge of the Gave d'Ossau. Composed of twelve houses for some generations back, it had in 1867 nine families. In this airy oasis between the earth and sky, there live not quite seventy persons, almost all cousins of more or less close consanguinity, forming a little republic governed by a Council of Ancients, who decide, both as a first and as a last resort, all disputes, and who judge regarding the advisability of marriages between the girls of the republic and the young gars of the low-lying regions about them. The people of Goust are obliged to go to Laruns to celebrate all important solemnities, baptisms, marriages, and burials. With baptisms and weddings there is no difficulty. The newly-born are portable, and young lovers do not need to be carried. But whenever a death occurs at Goust, it is the custom to slide the coffin down the rocky slope, and to go and take it at the foot of the mountains (Moreau). Examples of longevity are relatively frequent in Goust. In 1605, a man died there aged 123 years. Republics, Smallest. Most school histories and geographies give credit to San Marino (q.v.) as the smallest and the oldest republic in the world. It is the oldest; hence it is fairly evident that for a long period it was the smallest. That pre-eminence it lost in the early seventeenth century, when Goust, in the lower Pyrenees, was recognized as an independent state by France and Spain. San Marino has now, as it ever had, 24 miles of territory; Goust has barely one mile. The population of the first was in 1910 reckoned at about 1000, of the latter at about 150. In point of population, therefore, Goust is larger than another baby republic, Tavolara, an island a few miles northeast of Sardinia, which numbers barely 50 souls; but the latter exceeds it in territory, being 5 miles in length by about 5/6 mile in breadth. The sole occupation of the people of Goust is the weaving of wool and silk. Their government consists of an assembly of old men, called the Council of Ancients, who decide all disputes and who are sole judges of the advisability of marriages between the young people of the place and those of the surrounding countries. Being good Catholics, consanguineous unions are either forbidden or discouraged, according to the degree of the relationship. Neither priest nor physician dwells within the place. All important ceremonies--baptisms, weddings, and funerals--are celebrated at the neighboring village of Laruns. For funerals it is customary to slide the coffin down the rocky slope and to regain it at the foot of the mountain. The citizens pay no taxes or imposts. A similar immunity is enjoyed by the inhabitants of Tavolara. In 1845 the absolute dominion over that island was bestowed by Charles Albert, King of Sardinia, upon the native family of the Barbaleoni, whose chief forthwith assumed the title of King Paul I. He was likewise King Paul the last, for on his death, in 1882, he desired that the kingly title be buried with him and the monarchy be transformed into a republic. No opposition was made by his relatives. The islanders drew up a constitution, under which they elect a president every six years, together with a council of six. The suffrage is extended to men and women alike. No salary is paid to either the president or the members of the council. It is noteworthy that Goust and Tavolara are both ignored by the cyclopaedias and the gazetteers, with the single exception of St. Martin's "Nouvelle Dictionnaire de Geographie." Here is a reference to Goust along with two other microstates in the children's annual "Chatterbox" (ca. 1920). The largest of these three little-known Republics is that of Andorra, situated in a fertile valley of the Eastern Pyrenees. It holds a kind of independent position between France and Spain, and it has seven thousand inhabitants. Its capital is Andorra, on the river Bulira. Andorra was made a free state by Charlemagne, in the ninth century, as a reward for services rendered to him by its inhabitants when he was marching against the Moors. The Andorrans are pleasant, hospitable people, who amidst their vines and forests and enclosing mountains live a very simple life. The island Republic of Tavolara, a free and self-governing state, is a mere strip of land, five miles long and half a mile wide, lying off the northern coast of Sardinia. But the tiniest Republic is that of St. Goust, with an area of barely one square mile! Its people (one hundred and thirty in number) live always in peace, thanks to their residence in such an inaccessible part of the Basses-Pyrenees. For the last two thousand years they have governed themselves by means of a council of twelve "Elders." The President of the Council is tax-collector, assessor, and judge. Source : "Guide des Pyrénées mystérieuse"
(...) aprés avoir dépassé la belle cascade de la gorge du Brousset, un sentier en zig-zag débouche dans une vaste anfractuosité de la montagne où se blottit le village perdu de Goust. Pendant douze siécles ce hameau de douze feux a vécu entre ciel et terre comme une république autonome. Il comptait vers 1850, 70 habitants tous apparentés. Un conseil d'anciens decidait en premier et dernier ressort de tout ce qui intéressait la communauté, jusqu'à la convenance des mariages entre les filles de la République et les garçons du reste de la vallée. Du fait de ses fonctions officielles, le garde-champêtre y faisait figure d'ambassadeur des autorités de l'Etat d'en-bas. Quand les gens de Goust allaient à Laruns pour les baptêmes, les mariages et les enterrements, c'était une sorte de voyage à l'étranger. Pour le transport des morts, l'escarpement sur lequel est situé le village rendait dangereux la maniement de la biére. Aussi les gens de Goust avait-t'il aménagé une glissiére dans une faille de la paroi et confiait à la pesanteur le soin d'amener le cerceuil au bas de cette piste où le cortége le reprenait (*). On vivait trés vieux à Goust, les centenaires n'y étaient pas rares. Palma Cayet en cite un qui mourut en 1605 à l'âge de cent-vingt-trois ans. An interesting fact about Goust is that it it, very technically, an ancient republic legally independent of France, since the 14th century or earlier. It is ruled by a council of the elders, and still maintains its obscure and unknown legal independence, although for all practical purposes it has been governed by France for over 100 years. Some families of Goust have maintained files of old journal clippings about this subject.